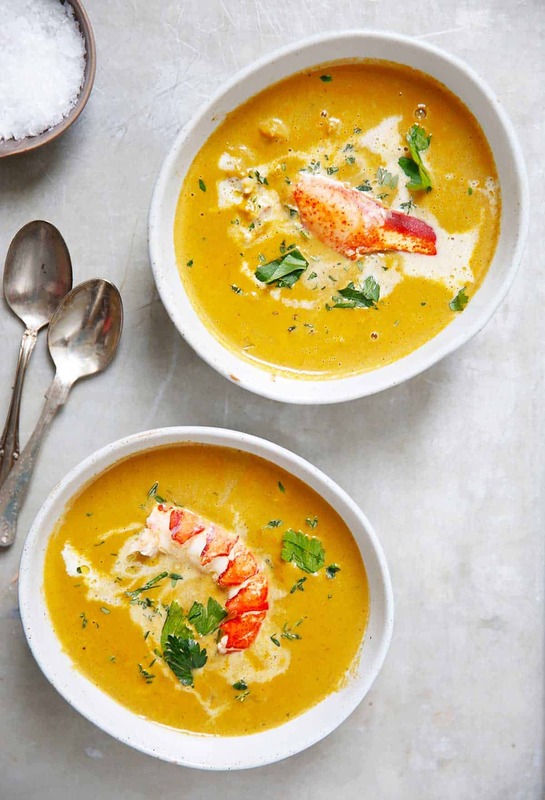 This Classic Lobster Bisque is so creamy, flavorful, and surprisingly simple to make. A must-make if you love lobster! It’s perfect for a late summer evening shared with friends! There is an option to make this dairy-free, and can be Paleo, Whole30 and Keto friendly! Living in New England, Summer means lobster rolls, lobster bisque, and all things lobster! 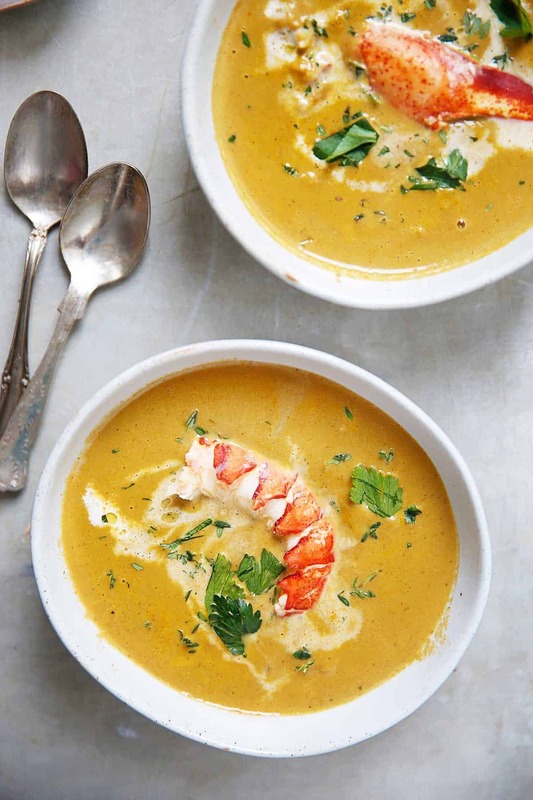 Though a warm dish, lobster bisque still screams summer to me!! Where we buy lobster: We go to local fish markets to get our lobster! I like supporting local business owners, and I often find the quality to be superior. 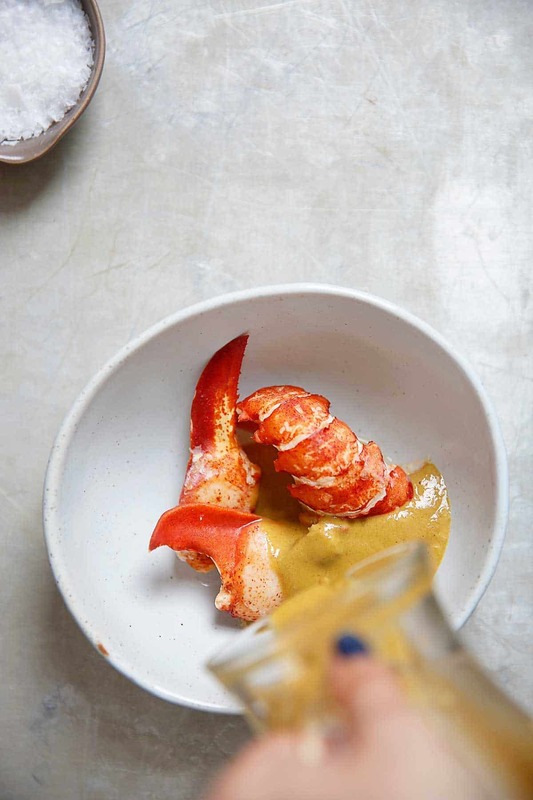 Also, you can usually buy cooked lobster meat out of the shell, which saves lots of time and effort when making your own lobster bisque! I always save extra lobster to garnish and look fancy! I mean, just look at how amazing this looks! Make it classic with local, good quality heavy cream, or opt for a dairy-free version! splash hot sauce of choice, we love Frank’s Red Hot Original! In large dutch oven, heat oil over med-high heat and sauté shallots, onion and garlic for one minute. Add the celery, carrots, and mushrooms. Cook for 5-8 minutes until mushrooms have browned and the carrots have softened. Deglaze the pan with the white wine. Cook for 2-3 minutes. Add the hot sauce, thyme, paprika and salt and pepper. Saute for another minute. Add the broth and mix well. Stir in tomato paste. Pour into a high speed blender, or use an immersion blender, and blend until creamy. Return blended onion mixture to pot and simmer over low heat for 10-15 minutes. Whisk in heavy cream and butter and bring to a low simmer. Add in lobster. Cook for 2-3 minutes until lobster is heated through. Serve hot topped with parsley and fresh thyme. 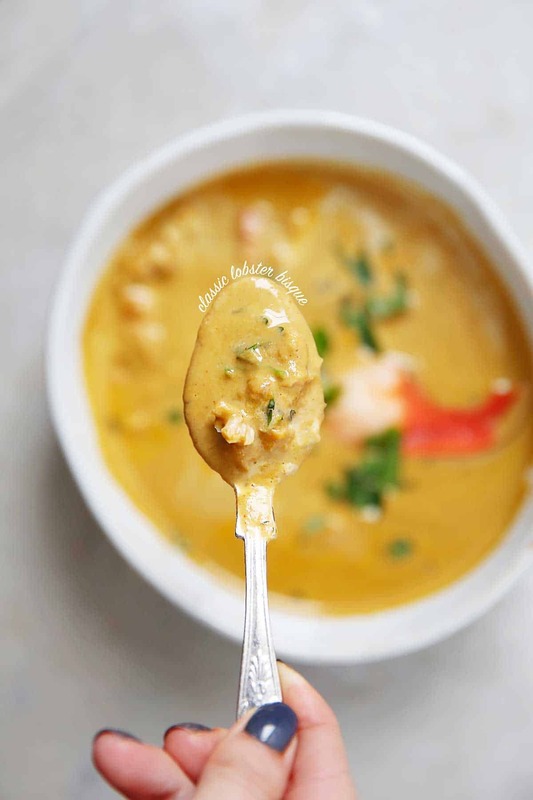 If you don't have a high speed blender, make sure to blend the soup long enough to reach a creamy consistency. Dairy free substitute: Use cashew cream. The cashew cream will be thick. Use 1 cup of the cashew cream in place of the heavy cream in step 7. If re-heating the dairy-free soup, you might need to add more stock to thin the consistency out. Amazing recipe, I need to try this. It looks delicious! Thank you!! Hope you love it if you end up trying it! !